The babirusa is a wild pig with curly tusks found only on the islands of Sulawesi, Toga and Molucca of the Indonesian archipelago. Their habitat is the rainforests and canebrakes, near rivers and lowland forests. Togian, and Moluccan babirusa. These subspecies have different hair covering, hair color, and tusk and body sizes. Fossil studies seem to show that the babirusa may be more closely related to hippopotamuses than pigs. The name babirusa in Malay means "pig deer". It got this name from its bizarre tusks. The upper canines actually grow up through the skin of it snout from the inside. These 12 inch long tusks then grow up and curl over towards the forehead, sometimes touching the snout again. The lower canines are also very long and protrude from the sides. The two sets of tusks give the appearance of the antlers of a deer. Only the bottom tusks are used offensively. The top tusks can't be used for foraging or as weapons because they are very fragile and lose in their sockets. Females have shorter tusks, or none at all. Babirusa are smaller than domestic pigs. They are 2.8-3.6 feet in length, and 2.1-2.6 feet at shoulder height. The tail is 8-12 inches long and not twisted. Babirusas weigh from 95-220 pounds. This curly-tusked pig has a rounded body with almost hairless, bristly skin. The sparse hairs are yellowish in color. Their skin is gray to brown, with a lighter colored underbelly. Their legs are thin and longer than on most pigs. Mature babirusas have large folds near their necks and bellies. Babirusa reach sexual maturity from 1 to 2 years. After mating the pregnancey lasts 150 to 157 days. The babirusa only gives birth to 1 to 3 young at a time, unlike other pigs who will have 7 to 9 piglets. The mother babirusa will lie down to nurse her piglets. Although the young will begin to forage within the first week after birth, they aren't weaned until they are 6 to 8 months old. The babirusa has a life span of 24 years. The babirusa is usually a solitary animal, although it will sometimes live in small groups. Its habits are duirnal, and it tends to feed in the morning. Its diet consists of fruits, nuts, mangos, mushrooms, leaves, and insects found in rotting wood. Unlike other pigs it doesn't root around the dirt for food with its snout. It moves along well-worn trails along the rainforest floor within their territories. It is a fast runner and a good swimmer, and has been seen swimming to off-shore islands. It has a good sense of smell and makes grunting and moaning sounds. When it gets excited it chatters its teeth. Like most other pigs it loves to wallow in mud baths to rid itself of parasites. 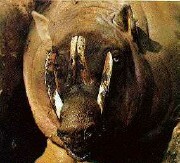 In the past babirusa were kept by rulers in Sulawesi and given as gifts to visiting diplomats. Masks of Balinese demons often resemble the stangely tusked babirusa. Unfortunately the future doesn't look good for this amazing creature. They have always been scarce, but are an endangered species today. Although the babirusa avoids farmlands, and isn't persucuted by farmers, it is a favorite target for poachers. Their limited and small pockets of rainforests are also being converted into agriculture. Their wild population is estimated at around 4,000 to 5,000 animals. The IUCN put them on their vulnerable list in 1996, and the U.S. ESA considers them endangered They are on CITES Appendix I.